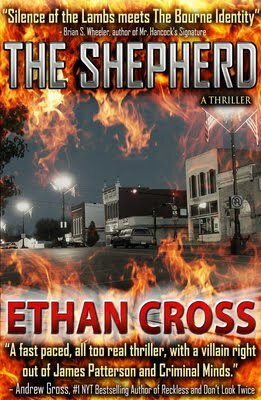 The Shepherd is an action-packed thriller that will keep you interested until the very end. Marcus Williams is an ex-cop who has seen his fair share of human brutality. He has inherited a house from his aunt and begins to settle into the quaint and charming town when he finds himself on a path he has no control over. After getting into a fight with some locals while walking the Sheriff's daughter, Maggie, home, we learn of Marcus's skill in combat and his quick thinking actions in high adrenaline situations. Maggie and Marcus begin to look forward to their future together, each seeing in the other a magnetic spark. After Maggie takes Marcus to meet his next door neighbour, they learn that the sweet kind grandmother has been brutally murdered. From here things begin to escalate and the powers in control are dancing the unbeknownst players like puppets. Francis Ackerman Jr. is a intelligent and good looking, however, he is also sadistic, brutal and a serial killer, a very good serial killer. He likes to play games with his victims, play with their minds, and make them do horrific things in order to survive. If the victims play by the rules, he allows them to live to win his game, however, Francis Ackerman never loses. When Francis comes to realize that he is a pawn in a game he did not create, he realizes that the stakes have become greater and while he is willing to play, he first, needs to change a few rules. As good and evil come together to figure out the reason fate has joined them on this mission, we are caught up in the turmoil and the aftermath, and taking on a ride through hell and back. Who do you trust?? How does the government play into all this?? Who holds the strings that makes everyone dance?? Francis and Marcus are lead to the answers, with one believing he could be good if his need to be evil wasn't precipitated and the other who believes he could be evil, if he was to release the control he keeps upon his soul. Together the two must wrestle their own demons to find the truth about why they have become who they are. I liked The Shepherd very much and found it to be an easy read, however, the crime scenes are descriptive in their brutal nature, if you are squeamish, be forewarned. I found the character of Ackerman to be well-written, and very believable as the serial killer. I felt torn between liking him and being repulsed by him. I liked how even though he was a serial killer, he had a side to him that was almost humane, there were a few testimonies of this throughout the story. I liked the fast paced plot and the flow of the story was good, without much back-tracking to keep everyone in mind. I enjoyed how the characters were well distinguished from the other. I didn't like how Maggie was introduced in the story near the beginning and then you hear nothing about her for most of the story. The explanation before the mad hatter chaos ensued wasn't enough for me to have her ignored for most of the story after building her up to be a larger part, even though she is eventually re-introduced, you almost forget about her until she does. I'm also not sure if I liked the government conspiracy and the serial killer aspect, I think one or the other would have made a more enriching story instead of entwining the two together, but that is just me, and others may not find a problem with the two crossing together. All in all, the book is not a disappoint and you will find enjoyment in reading its pages if you like intelligent thrillers with some gore. Marcus Williams and Francis Ackerman Jr. both have a talent for hurting people. Marcus, a former New York City homicide detective, uses his abilities to protect others, while Ackerman uses his gifts to inflict pain and suffering. When both men become unwilling pawns in a conspiracy that reaches to the highest levels of the government, Marcus finds himself in a deadly game of cat and mouse trapped between a twisted psychopath and a vigilante with seemingly unlimited resources. Aided by a rogue FBI agent and the vigilante's beautiful daughter - a woman with whom he's quickly falling in love - Marcus must expose the deadly political conspiracy and confront his past while hunting down one of the most cunning and ruthless killers in the world.